Haitians in Brooklyn say they’re sure Bill and Hillary probably paid for Chelsea Clinton’s lavish wedding out of the kind of monies that came with the Haiti power her parents wielded. Watch Ezili Dantò’s selected video response to the flurry of news coverage regarding Hillary Clinton’s emails on Haiti. Especially Chelsea Clinton who wrote to Bill and Hillary -“Mom, Dad, Cheryl, Doug, Justin” – about being profoundly disturbed by the US-led international earthquake response in Haiti. Haitians were the victims of well heeled predators. Chelsea Clinton was and still is profoundly silent about the US-led occupation and oppression in Haiti. Haitians were hurt, dying and shut out by the Internationals holding meetings after meetings they were not allowed into. It still goes on. It’s not the past. It’s not the past. Chelsea Clinton wrote that the international “incompetence was mind numbing.” But, Haitians in Brooklyn say they’re sure Bill and Hillary probably paid for Chelsea Clinton’s lavish wedding, out of the kind of monies that came with the Haiti power her parents wielded. It’s not the Crisis Caravan’s incompetence that’s mind numbing. It’s their fake innocence. It’s the deliberate disaster capitalism and its destructiveness. It’s the constant Clintonesque plausible deniability and flagrant impunity. That, is what’s mind numbing to Haitians. 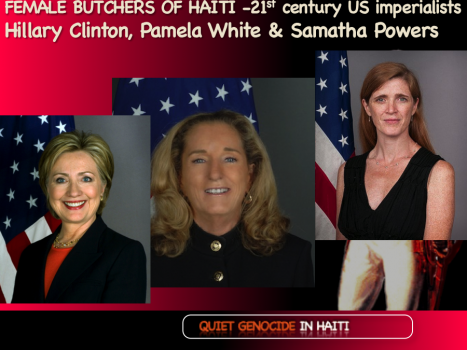 Chelsea, Hillary, Bill, Cheryl, Doug, Justin and Obama – all, murderers of Haiti sovereignty. 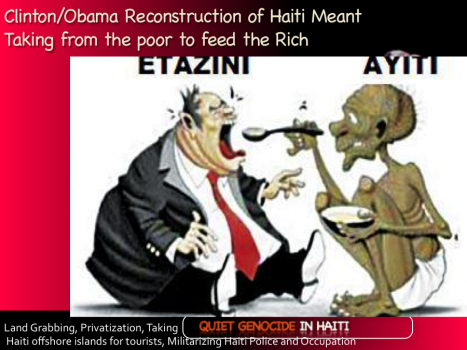 And yes, believe it: Haiti is freestyling to murder these Tarzans, Janes & their Uncle Toms. Ginen Poze. Freestyling, alone. But we’re still here telling the world that Haiti is occupied and terrorized by the United States behind a UN multinational facade and the NGO poverty pimps. To tell them the earthquake was an opportunity for the racist Euro-US ruling class to feed on Haiti hurt and rob Haiti blind with Michel Martelly decrees taking all of Haiti’s offshore islands for foreign business interests; with Bill and Hillary Clinton presiding over fake cholera democracy and elections while amending the Haiti Constitution to give a 25-year mining contract to Chelsea’s uncle. Tell them it was murder and neglect wrapped in racist Clinton-Obama disdain sold as white supremacy’s good intentions. Tell them Ezili Dantò said that, even before the process began. Said it, after Bill Clinton and Paul Farmer’s disturbing $3billion failures in Gonaives during the four back-to-back storms in 2008. Where did that money go? 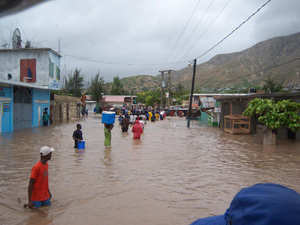 We said the Poverty Pimps had turned Haiti into a plantation and penal colony and were masturbating on Black pain in 2010 as today. Since 1503! Said, vengeance is we. Said, we’re Desalin descendants, not invisible prey. White narcissism can’t soothe and absolves itself in selected email releases. We’ve been Haiti freestyling to murder Tarzan, Jane and their Uncle Toms. This is a war cry, tell massah I coming back. Carrying FIRE in my knapsack. Tell him. I am Patrice Lumumba, Steven Biko, Fannie Lou Hamer. Tell him they have been born again in me. Tell him I’ve found my mother tongue buried in the rubble…Tell him this is the result of segregation. Tell him this is the result of integration. Tell him…I’ve never been invisible. Tell him, he has never been invincible. Tell him. I am melting the barb wire and steel bars of prison yards. Their going to flow over him like lava…I am returned. I am bloodthirsty…Tell massah I coming back. I coming back. –Karma by Dominique Christina. Ezili Dantò, Haitian Lawyers Leadership Network (HLLN) and Free Haiti Movement.